You think that the airport business is an old, lazy, uninteresting business. Not so in Asia and especially Malaysia. The competition among airlines (not airports) I guess has caused traffic to increase by leaps and bounds to the Malaysian airports. Some statistics just as reported today. 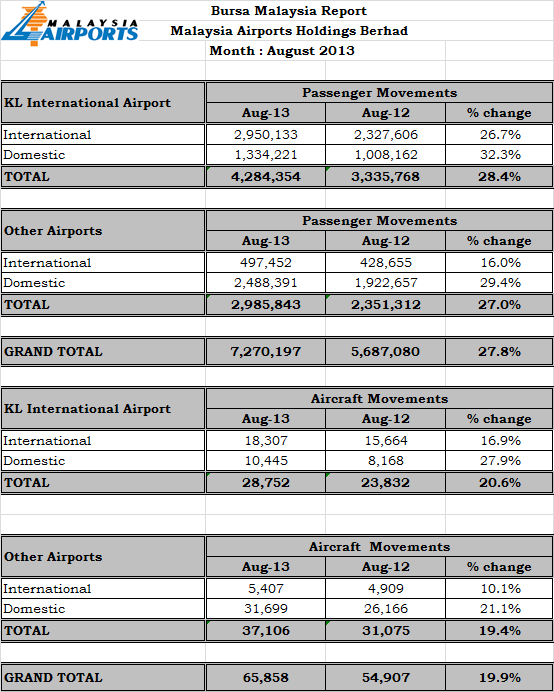 "Malaysia Airports handled 7.27 million passenger movements, an increase of 27.8% over August 2012. It is a record high for the system of airports surpassing the 7million mark for the first time and being the highest passenger movements achieved for a month to date. Before 2013, the previous highest record achieved was 6.57 million recorded in December 2012 which traditionally has been the highest passenger movements month. Encouragingly May, June and August 2013 also outperformed December 2012. International passengers reached 3.45 million, registering a 25.1% year-on-year increase while domestic passengers recorded 30.4% growth with 3.82 million passengers. The sound performance in particular for the domestic sector was unexpected as Hari Raya Festive Season also fell on the same month last year with a double digit growth of 13.1%. This is a double digit growth over the previous double digit growth in August 2012. The longer school holidays complemented by competitive air fares and sufficient seat capacity partly contributed to the remarkable growth. It is encouraging to note that the international sector’s equal credible growth was driven by inbound tourists that have gained momentum backed by tourism campaign for VMY 2014, new airlines operation, additional airlines’ seat capacity and oneworld effect. With the oneworld alliance and higher transfers within AirAsia group, the monthly transfer traffic at KL International Airport has increased by about 100,000 per month and it is increasing from month to month." Like I have said before, while the airlines are fighting themselves out - Malaysia Airport is enjoying. A simple business - in fact a monopoly if you look at it. Nothing difficult, but sometimes in life we just have to accept and get on with it as I do not like monopolies either. How hard it is to clean the airport toilet, manage air-traffic, mop and polish the floors, manage some tenants. The harder part is to compete for customers but this is apparently not the job of Malaysia Airport but Airasia, Malindo, Cathay Pacific etc. Of course, Malaysia Airport does pretty well in bringing in additional airlines but that is still easier as compared to what the airlines have to compete on. What will be your strategy with regard to the transition between WiMAX and LTE? The proven maturity of Mobile WiMAX (IEEE 802.16e) has helped us gain broad recognition as the fastest mobile 4G network in Malaysia. In fact, we have been rated by Speedtest.Net as the fastest wireless network in Malaysia since the day we launched 32 months ago. Since we are pure 4G, all customers regardless of location will have the same high performance experience. With an expansive 85 per cent population coverage, we are truly bridging the digital divide in the country. The 4G network we’ve built has proven to be robust and will continue to serve our customers well. Having said that, we realise technology will continue to evolve and have made certain to be future proof by building an all-IP network. We have no plans to retire the Mobile WiMAX network as it is proven to be robust and has delivered favourable economics. At the same time, we are excited to add LTE to our network to allow for an expanded array of device and service possibilities. Do you think the all-you-can-eat data pricing is sustainable or will pricing be based on data usage? We don’t believe in all-you-can-eat pricing as it is economically irrational. Utility-like charging is a key principle that has been guiding our pricing strategy since launch. We correctly anticipated the arrival of a multi-device world and have created a network capable of concurrent access for both data and telephony – and essentially the world’s first share everything network. A single Yes ID – thereby a single price plan – gives our customers access to all sorts of devices and applications concurrently. This liberates our customers to use the right device(s) at the right time without the hassle of subscribing to more and more price plans. We are proud to say that we don’t just offer solid performance, we also deliver consumer surplus. What do you believe will be the biggest selling point for consumers and business for 4G LTE? We always believe it is not the access, but what our customers do with the access, that creates value. The world is evolving toward cloud services and always-on connectivity. And we are excited that such global trend will create more demand for our services. We are well positioned to support this new paradigm of connected living – whether it is for work, learning, or play. Can you talk us through your SIM card free infrastructure and will this carry over to LTE? Simply put, we are seamless as a result of being SIM-less. Our ID based network is fully in line with the web, which also operates based on user identifies. This puts us in a favourable position to ensure our network is compatible with innovations from the Web. We will surely take this key design concept forward into the LTE world using the Yes ID as the master identity. What uptake are you seeing from telco managed cloud services for corporate customers? Telco’s have strong experience running highly scalable and robust infrastructure. In the context of cloud computing, this expertise could be quite interesting. But we are also keenly aware that the web innovates super fast and it is important for us to position our network not to be the ultimate end point but a trusted and value-add linkage to the exciting world of Internet innovations. What are you most looking forward to with regard to your speaking role at LTE Asia? We are looking for to an information exchange with fellow practitioners and getting to meet potential partners in order to explore new ideas. What major developments have there been for the broadband industry in your region over the past year? We are starting to see early stage deployment of 4G LTE in the region. Having launched the world’s first converged 4G network over two years ago in Malaysia, we now have an expansive footprint of over 4,000 base stations – all running the same 4G technology. We are heartened to see operators in the region starting to dabble with 4G technologies but most of them still rely on 3G or 2G fall-back as their 4G network build-out is still at early stage. At YTL Communications, we pride ourselves in having the broadest ubiquitous 4G network in the region and we look forward to leading by example to show the world how to fully unleash the power of having 4G everywhere. What opportunities do the new cloud services provide for operators? Cloud computing is one of the most exciting internet megatrends globally. For those that understand the value of cloud computing, this is an once-in-a-lifetime opportunity for operators to finally be in sync with the innovation curve of the internet. But cloud computing is only as effective as the availability of consistent high speed; low latency connections. It therefore underscores the key attributes of 4G – mobility, high speed and low latency. Surely you can get the latter two attributes of high speed and low latency from fibre connections, but when cloud is ubiquitous, so should the connection. For all these reasons, we feel the ubiquitous mobile 4G network we have built is perfect for cloud computing. What are the key challenges around the monetisation of data? Analysis of usage trends and basic economics clearly indicate that all-you-can-eat data pricing is not sustainable – period. Data can’t be billed as a series of 0’s and 1’s. Policy-based charging, modelled after usage patterns and adaptive to network conditions, is an emerging need for any operator that intends to stay in business for the long run. How important to your rollout plans is wifi offload? We also have embraced wifi. We proudly run a 4G power hotspot service on our KLIA Airport Express rail with seamless handover at 160km/hour. And we recently launched with KTB, the largest motor coach operator in Malaysia, high-speed mobile hotspot on their buses. This enables a whole new way to enjoy bus rides across the country – be it long or short haul. We all know that operators with older 3G technologies predominantly use wifi offload to handle capacity issues. But for us, wifi is an acquisition play. The fact is, we are already taking the lead in energising the 4G ecosystem with leading-edge devices – we have one of the broadest 4G device portfolios in the world. But there is no denying that wifi is still the world’s more ubiquitous wireless radio, available on most consumer devices. It is therefore the simplest way for our potential customers to get a Yes ID to log in to our 4G powered hotspots to start to enjoy our network. We are confident they will have a fantastic experience and will opt to sign up for service and use the same Yes ID to enjoy our world-class service on the widest nationwide 4G footprint and our expanding 4G hotspot footprint. Where does fixed wireless come into your planning and if so what technologies will you be using? We are already using several wireless backhaul technologies to accomplish that. When it comes to fixed wireless, it is really about being competitive at the unit cost level and the speed of deployment. With networks where there are a mix of technologies in play are HetNet technologies the answer? If so, how best can they be exploited? HetNets are somewhat of a necessity when technology is ever evolving. For HetNets to deliver on their promise seamless handover and unit cost reduction are key considerations. What is the most exciting development you expect to see in broadband over the next 12 months? Building and running a 4G network can only be the start of something much more exciting. We see the twinning of 4G network and cloud technology as one of the most exiting fusion opportunities around. In fact, we have been hard at work to create a cloud-based learning platform together with some of the world’s best players in this space and have started deploying it, along with our 4G service, to all 10,000 public school in Malaysia with strong support from the Ministry of Education in Malaysia. Combine with our ubiquitous 4G network, learning will be interactive, collaborative and can be performed anytime, anywhere. This is a truly exciting opportunity and we will do our best to show the world how cloud computing and 4G technology can come together to create a new platform that will help an entire nation. What do you think about MNRB? It is a fruit ripe to pick? Hng,with due respect,I think it's time you stop bombarding everybody's blog trying to promote whatever it is that you are buying.Not fair to the owner of the blog..Apologies Felice. You are absolutely right. Heh heh heh. Just share latest information with regard to YTLP, Wimax and TD-LTE here. If offend anyone here, my sincere apologized. 30% growth in domestic passengers movement is a terrific number. Felice, you have spotted on yet again. You share the very same ability with Buffett on identifying "business moats". I am seeing more and more ordinary people taking regular flights from KL to Penang/ JB, as the flights became more affordable nowadays and better value than riding buses. Westports is going for listing in mid Oct. What do you think about that port then? Noticed my comment is half hanging. What I meant was the seaport is also on a growing trend. When I was there, we were building Terminal 4. And when I left after 3.5 years, they just completed building Terminal 5. Now they are building Terminal 6. In average, they build a new terminal to cater for the growth in every 3 years. Sorry that I do not have the time to do in depth study on Westport. My personal guess is that it is a good business. Well managed especially by Tan Sri Gnanalingam. Not so sure of his CEO son though - but think it is still good. I am however wary of overpricing. Haven't done study but guess is a good to go, my personal feeling. Yesterday I was looking at flight to KK, surprisingly Air Asia has 14 daily flight to there. The Govt can't do anything to control the monopolies? Amendments on tax, flight regulations for example.